CPT recently opened the first of what we hope are multiple satellite locations. The location we selected is Eugene, Oregon. We selected Eugene for multiple reasons. First, an outstanding trainer who formerly worked for CPT in Atlanta moved with her husband to Eugene and later expressed interest in renewing a business relationship. Thus, the trainer was already familiar with CPT’s standards, practices, and protocols. Second, Eugene has demographics that are in most respects comparable to Atlanta. Third, there is limited dog training competition in Eugene. Therefore, CPT won’t have to battle many businesses that have long and/or strong customer relationships and solid brand recognition. Eugene is in the southern end of the Willamette Valley, about a 50-mile drive west from the central Oregon coast taking SR 126 and approximately a 2-hour drive south of Portland on I-5, 70 minutes south of Salem, the state capital, and 45 minutes south of Corvallis, the home of Oregon State University. Eugene is divided into north and south by the Willamette River, which originates in the mountains south and southeast of Eugene and then flows north as a major tributary of the Columbia River. Moreover, locals know to pronounce the river properly (wil-AM-it), as the lack of proper pronunciation is a quick way to identify a tourist. Geographically, Eugene encompasses a total of almost 44 square miles and wrests at an elevation of 426 feet above sea level. The city is situated in a valley surrounded by Skinner Butte and the Coburg Hills to the north, Spencer Butte to the south, and Mount Pisgah to the southeast. Further out the city is surrounded by hills and timberland to the south, east, and west and flat valley farmland to the north. North along I-5 there is also more population density than toward the coast, inland, or south. The Willamette River runs along the northern perimeter of Skinner Butte Park and the University of Oregon campus and divides the campus from Alton Baker Park and Autzen Stadium. Another major waterway, the McKenzie River, runs east-west slightly north of the city until it meets the Willamette River in a suburb called Fit Grove. Various geographic landmarks help to divide the city into 23 neighborhoods, each of which has a distinct neighborhood association. Some of the neighborhood associations manage school systems apart from the City of Eugene School District. In alphabetical order, the neighborhoods are Active Bethel, Amazon, Cal Young, Churchill, Downtown, Fairmount, Far West, Friendly, Goodpasture Island, Harlow, Industrial Corridor, Jefferson Whiteside, Laurel Hill Valley, Northeast, River Road, Santa Clara, South University, Southeast, Southwest, Trainsong, West Eugene, West University, and Whiteacre. In an effort to learn the area geography and obtain a feel for the people CPT fortunately had the opportunity to visit a majority of Eugene’s beautiful neighborhoods. The hills north of Eugene, along with a view inside Autzen Stadium, as seen from atop Skinner Butte. North Eugene with its heavily forested background as seen from atop Skinner Butte. The hills and forests northeast of Eugene as seen from atop Skinner Butte. Downtown Eugene as seen from atop Skinner Butte. Looking south, downtown Eugene and Spencer Butte as seen from atop Skinner Butte. According to the US Census Bureau, Eugene has a city population of approximately 166,600 persons, making it the second most populous city in Oregon, behind only Portland, and the 155thmost populous city in the United States. The population is growing at a rate of over 1.1% per year, which is larger than the 0.7% growth for the country as a whole. The Eugene-Springfield metropolitan statistical area (MSA) has a population of 352,000 persons, making it the third largest MSA in Oregon, behind only the Portland-Vancouver-Hillsboro MSA and the Salem MSA, and the 146thlargest MSA in the country. The demographic composition of the residents is in some ways similar to and in other ways very different from Atlanta. The population density is 3,572 per square mile, which is 13% more than Atlanta. The housing density is 1,600 units per square mile, which is approximately 11% less than Atlanta. Therefore, from a density perspective, comparatively more people are living in fewer homes, most likely because of more shared homes and more families (versus single adults) residing in Eugene. According to DataUSA, the median household income in Eugene is $44.9K per year, whereas in Atlanta it is $53.8K. The greatest difference is in households in the highest income strata. 3% of Eugene households earn more than $200K per year, whereas 8.4% of Atlanta households earn more than $200K. 23.1% of Eugene residents live below the poverty line, which is comparable to Atlanta’s rate of 22.4% and much higher than the national average of between 15 – 16%. The median age is 33.9 years, which is close to Atlanta’s median age of 33 years and much lower than the national median of 37.4 years. The median property value is $246,400, which is slightly less than Atlanta’s median value of $262,600. The average commute time is 16.9 minutes, which is much shorter than Atlanta’s 24.4 minutes- and our visit can attest that Eugene rush hours are much shorter and much less severe, which trainers appreciate when traveling to in-home appointments. One can get most anywhere in the Eugene metropolitan area in less than 20 – 25 minutes. The most significant demographic disparity is in the racial composition. 85.8% of Eugene residents are classified as White/Caucasian, 7.6% Hispanic/Latino, 4% Asian, 1.4% Black/African-American, and 1% Native American, and 0.2% Pacific Islander. In contrast, Atlanta is 54.0% Black/African-American, 37.5% White, 5.2% Hispanic, 3.1% Asian, and 0.2% Native American. The second most salient difference is in regard to religion. According to Sperling’s Best Places, 25% of Eugene residents consider themselves religious, whereas a much larger amount of Atlanta residents (48.4%) consider themselves religious. Of those who are religious in Eugene, most are Protestant, Catholic, and Mormon/LDS. Eugene has a much larger Mormon population than in Atlanta, and a much smaller Baptist, Methodist, Presbyterian, Jewish, and Islamic population. The third most conspicuous difference is the crime rate. According to Sperling’s Best Places Eugene has a violent crime rate that is less than ¼ that of Atlanta and a property crime rate that is 15% less than Atlanta’s. The fourth most apparent difference is in the percentage of educated adults. According to Sperling’s Best Places, 39.9% of Eugene residents earned a 4-year college diploma, whereas 47.2% of Atlanta adults achieved a Bachelor’s degree or greater. The figure is surprising considering the prominence of the University of Oregon and Eugene’s reputation as a college town. Hendricks Park is known for its rhododendron garden. Hendrick Park's rhododendrons come in many varieties and colors. The Hendricks Park rhododendron garden. Beautiful white rhododendrons at the Hendricks Park rhododendron garden. A more classical rhododendron at the Hendricks Park rhododendron garden. A stunning red rhododendron at the Hendricks Park rhododendron garden. A bright yellow variety at the Hendricks Park rhododendron garden. This rhododendron stood out for its density of flowers. A side view of the previous rhododendron. Multiple varieties of rhododendron at the Hendricks Park rhododendron garden. Hendricks Park- The memorial at Pre's Rock, where track star Steve Prefontaine died in a car accident. Hendricks Park- A closeup of the memorial to Steve Prefontaine. Of those registered to vote in Eugene, 43% list themselves as Democrats, 25% Republicans, 7% with third parties, and the remainder unaffiliated. The preceding statistics are also mostly constant throughout neighborhoods, whereas in Atlanta the urban area has a much higher percentage of registered Democrats than does the suburbs, which has a majority of Republican voters. One other cultural difference is Eugene’s reputation as a home for green believers and activists and for persons who maintain a 60s-ish hippy counterculture. The cultural emphasis spawns tight communities and a strong support of the performance, musical, and visual arts, both as participants and consumers. Eugene is home to the University of Oregon, which along with the Peace-Health Medical Group is one of the cities 2 largest employers. The next largest employers are all government organizations: The US government, the City of Eugene, the Springfield School District, Lane County, the State of Oregon, the Eugene School District, and Lane Community College. CPT likes the animal friendly and outdoor friendly atmosphere in Eugene. The City of Eugene Animal Services estimates that there are over 40,000 dogs in Eugene, of which 40% are licensed. Lane County, in which Eugene is the County seat, allows up to 8 dogs per household. The dog population equates to 0.57 dogs per household, which is slightly higher than the national average of .545 dogs per household extrapolated from AVMA data, but lower than dog ownership figures for Atlanta published by Realtor.com. Yet, whereas Atlanta has multiple dog training companies that employ 5 or more trainers, Eugene has only 1 noteworthy training company that employs more than one trainer and the referenced organization only employs 2 trainers. Consequently, Eugene should provide promising opportunities. A view east of Eugene from the top of Spencer Butte, the highest point in Eugene. A zoomed view of the previous image. A view south of Eugene from the peak of Spencer Butte. Notice all the timberland. A southwestern view from the top of Spencer Butte. A northwestern view of Eugene from the peak of Spencer Butte. A northern view into downtown Eugene from the peak of Spencer Butte. A northwestern view from the peak of Spencer Butte. A panoramic view from the peak of Spencer Butte. A western view from the peak of Spencer Butte. A view from atop Spencer Butte toward the beautiful forested hills surrounding Eugene. A view from atop Spencer Butte of the grass farms and pastures proximal to Eugene. The hills proximal to Eugene as seen from atop Spencer Butte. An additional scenic view from atop Spencer Butte. A view of Lane County's forests from atop Spencer Butte. A home on the outskirts of Eugene as seen from atop Spencer Butte. What a beautiful home! Plentiful wildlife, miles of forest, peace and quiet, and no HOA covenants. 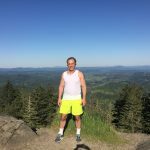 CPT's Mark Spivak taking in the landscape after a trail run up Spencer Butte. Slogans for Eugene include “A Great City for the Arts and Outdoors,” the “Emerald City,” and “Track Town, USA.” The first slogan pertains to the multiple recreational opportunities available in and about Eugene, including cycling, running, rafting, kayaking, and hiking, as well as skiing only 1-hour away during winter months, and all-year round 2.5 hours away at Mount Hood. The second nickname, “Emerald City,” is noted in the green and yellow colors of the University of Oregon Ducks. “Track Town, USA” emanates from Nike’s origination in Eugene, Phil Knight’s participation as a University of Oregon track athlete, his sponsorship of the University’s sports teams, the University’s success in the sport of track and field, and the University’s frequent hosting of significant track events. Eugene has an art museum, a natural history museum, an air and space museum, a history museum, and a science center. In addition, there are over 20 private art galleries. For the performing arts, Eugene has a number of community theaters, a symphony, a ballet, an opera company, several choirs, and holds a cornucopia of multiple music festivals featuring from classical to bluegrass. Concert halls go from small to large, including the architecturally exquisite Hult Center for the Performing Arts, the Shedd Institute for the Arts, and Matthew Knight Arena, where the Oregon Ducks basketball team plays, as well as many touring rock bands. The University of Oregon Ducks are the major sports attraction. The Oregon Ducks typically have nationally ranked football, basketball, track, and cross country teams. Autzen Stadium seats 54,000 spectators for football. Matthew Knight Arena sits 12,364 for basketball. Eugene also hosts the Eugene Emeralds, a Class A minor league baseball team that plays at PK Park; an annual Nationwide Tour golf tournament at the Shadow Hills Country Club; the Eugene Generals, a junior ice hockey team that plays at the Lane County Ice Center; college teams from Lane County Community College and Northwest Christian University; and minor league basketball, rugby, and soccer teams. There is also plentiful media. ABC, CBS, NBC, Fox, and PBS staff local affiliate stations. There are also 3 independent television stations and numerous FM and AM radio stations. Eugene has local public bus transportation, but no local rail transportation, although there is an Amtrak rail station. Many people also commute via cycling. The US Census Bureau states that 7.3% of residents commute by bicycle, which is the 5thhighest in the USA and 13x higher than the national average. Eugene Airport is the 5thlargest in the northwest. However, most persons flying from Atlanta will fly direct to Portland and then drive to Eugene. Those wishing to fly from Atlanta to Eugene Airport will likely fly a Delta connection from Salt Lake City or Seattle. Eugene also has multiple private general aviation airports and several heliports. A sign at the trailhead of the Salmon River Trail within the Salmon-Huckleberry Wilderness of the Mount Hood Recreation Area. A photo of the Salmon River taken from the bridge on Salmon River Road in Welches, OR. A calmer portion of the Salmon River near the beginning of the Salmon River Trail. A sign about 100 yards past the trailhead of the Salmon River Trail. A map of the Salmon River Trail and the Salmon Huckleberry Wilderness. A few months after this photo was taken the Wilderness area was temporarily closed due to a cougar attack. The attack was Oregon's first recorded human death due to cougar aggression. Aquatic and vegetative scenery along the Salmon River Trail. A view of the Salmon River from along the Salmon River Trail. A calm portion of the Salmon River along the Salmon River Trail. The Salmon River Trail accesses the Salmon-Huckleberry Wilderness and travels through mossy old growth forest next to the wild and scenic Salmon River. Chinook and Coho salmon, along with Steelhead, Rainbow and Cutthroat trout are found in the river. There are several established campsites along the way for backpackers (Reference: USDA Forest Service). The Salmon River Trail climbs from the edge of Salmon River to a bluff with several view points and follows the north shoulder of the river. The trail generally follows gentle terrain, but there are several steep sections along the way. The width varies from narrow to wide with the better tread found on the west and east ends of the trail. Access to this trail is best from the west end and is a great through hike (Reference: USDA Forest Service). Current Conditions: 9/12/2018: Temporarily closed, due to cougar activity. Permit Info: Wilderness Permits are required between May 15 and Oct 15. Passes: A valid Recreation Pass is required at the Salmon River West trailhead from May 15th through Oct. 1st. Information Center: Zig Zag Ranger District, Zig Zag Ranger Station (Reference: USDA Forest Service). Mark ran about 3 miles in and out of the Salmon River Trail for a total of a 6-mile trail run. The scenery was serene and the weather a nice change from Atlanta's heat. During the second day at Mount Hood I completed a 7.5 mile trail run on the Ramona Falls Trail. This trail enters the Mount Hood Wilderness. Ramona Falls is a jewel drawing visitors to the area. The Sandy River, a designated Wild and Scenic River, is a dramatic example of the forces that a glacial fed river can bring forth to change the landscape. Physical signs of a volcanic debris flow from over 200 years ago are evident where the trail is near the Sandy River (Reference: USDA Forest Service). Most visitors access this trail from Ramona Falls Trailhead. The distance round trip for this point is 7 miles. From this trailhead, visitors take the Sandy River Trail one mile eastward to where it crosses the Sandy River. (The Pacific Crest National Scenic Trail #2000 overlaps with Ramona Falls for a couple miles in this area.) Equestrians going to Ramona Falls will stay on the southern side of the loop that goes along above the Sandy River. Hikers can choose which way to do the loop. It is about the same distance either way. Overall the route is a gentle climb gaining 1000’ over the 3.5 miles to the falls. (Reference: USDA Forest Service). The Sandy River was narrow during the time of my hike, but is wider during other times of the year and after a big rain. Moreover, the water moves rapidly. A few years before a hiker attempting to cross the River was swept away and drowned. The foot bridge across the Sandy River collapsed. Therefore, the crossing was a precarious, makeshift alternative walking over a downed tree. A view of stunning Mount Hood from the Ramona Falls Trail. A view of stunning Mount Hood from the Ramona Falls Trail. An exquisite snow cap for the month of May. Mount Hood as seen from the Ramona Falls Trail. An outstanding photograph of regal Mount Hood as seen from the Ramona Falls Trail. A closeup of a scenic view from the Ramona Falls Trail. I also took some wider angle views of the same scene. A medium range view of the prior scene. A wide angle view of the prior scene. After the difficult and precarious crossing of the river, which is absent of a foot bridge, and where downed trees must substitute, the hike crosses some sandy areas and then makes a long steep climb toward the Falls. As the Trail increases in elevation it reaches a vista where the Sandy River enters a deep gorge. I ran up, then took a break at the top by the Falls and then ran back down the other half of the loop of the Trail, where each way I only slowed to take photos. I am glad I took the photos. The Mount Hood Wilderness is beautiful and peaceful. I did not meet many hikers, campers, or trail runners during my journey. There are so many trails by Mount Hood. Therefore, the trails don't become crowded, especially on weekdays. After finishing the climb along the Sandy River the Trail started to flatten. The Trail then entered forest as it approached the highlight of the Trail, Ramona Falls. The elevation is high enough so that there was still snow on the ground in mid-May on a day in the high 70s. The Ramona Falls Trail peaks at Ramona Falls, where there is a loop trail to return to the trailhead. Alternatively, for the more venturesome or those with more time, above the Falls one can connect to the Timberline Trail, which takes hikers/trail runners up Mount Hood all the way to the timberline, an elevation of slightly over 7,000 feet. It stands to reason that Ramona Falls is the highlight of the Ramona Falls Trail. A view of Ramona Falls from a different angle. Another angle when viewing Ramona Falls. The steep rock cliffs along the return loop of the Ramona Falls Trail. Current Conditions: Please Note: Glacial River crossings on the flanks of Mt. Hood Wilderness do not have foot bridges. Hikers should be prepared for dangerous river conditions. Please follow the River Crossing Safety Guidelines. Restrictions: Wilderness restrictions apply in Mt Hood Wilderness. Passes: A valid Recreation Pass is required at Ramona Falls trailhead from May 15th through Oct. 1st. A view of Mount Hood as seen from the return loop of the Ramona Falls Trail. A view of Oregon's most famous natural landmark, snow capped Mount Hood, as seen from the return loop of the Ramona Falls Trail. Mount Hood is only 60 - 90 minutes outside of Portland, which provides marvelous outdoor recreational opportunities for Oregonians. The city is named after Eugene Skinner, who arrived in the Willamette Valley with 1,200 settlers back in 1846. He constructed a cabin and trading post on what is now known as Skinner Butte, a prominent hill and landmark in north Eugene and the sight of the “Big O” emblem of the University of Oregon. In addition to operating the trading post, Skinner owned a ferry service that transported people across the Willamette River. In 1849, after Oregon was named a US territory, the prodigious Skinner became the local postmaster and later became an attorney and the county clerk. The settlement became known as Eugene City in 1853. In 1858, despite what started as a cordial relationship between Skinner, fellow settlers, and the indigenous Kalapuyan tribe, pressure from an increasing population of colonists prompted the forced relocation of the Kalapuyan Indian population historically native to the area. The Kalapuyans were moved to the Grand Ronde Indian Reservation in northwest Oregon. The reservation exists today with a land area of over 16,000 square miles, but a population of only 55 Native Americans, as the majority of Kalapuyans and other tribes native to Oregon had to move elsewhere to find worthwhile employment. Skinner died in 1864 after a long illness, but his name lives on, as in 1889 the name of Eugene City was shortened simply to Eugene. In 1876 the University of Oregon opened. The community continued to grow due to the university and the timber industry, although now health care, federal, state, and local government, and high-tech share in providing the majority of jobs. People love the Eugene climate, which is characterized by warm and dry summers, cool and wet winters, and frequent light rain during spring and fall. The average yearly winter snowfall is 4.9 inches. However, the median snowfall is 0 inches. The mean snowfall is much larger due to the occasional effects of a pineapple express low-pressure system that will on rare years cause accumulations as high as 41.7 inches. The hottest months are July and August, which both have an average daily high of 82° F. The coldest month is December, which has an average daily high of 45.6° F. The wettest month is December, when there is an average of 7.83 inches of precipitation and 18 days of precipitation. November, January, and March also have 18 days of precipitation, but there is a lower average volume of rain. If there is snowfall, it is most likely to occur in December or February. There is an average of 3 days of snow accumulation per year. Overall, in comparison to Atlanta, Eugene is cooler throughout the year, which makes for more comfortable summers and less comfortable winters. Due to the amount of rain and cloud cover in the spring, fall, and winter, Eugene has 13% more rainy days than Atlanta and 40% fewer sunny days. In addition, there is a combination man-made and climate characteristic that may negatively impact many people. Due to grass farms that are common in the northern Willamette Valley, southern wind patterns in the summer, and the confinement of such winds by the surrounding hills, Eugene has the highest grass pollen counts of any city in the United States. Fortunately, the pollen count was not a bother during our May visit. The mild climate lends itself to an active outdoor culture. There are numerous hiking and jogging trails throughout the Eugene area and multiple parks. The most significant parks are Alton Baker, Amazon, Spencer Butte, Skinner Butte, and Hendricks. The top of Spencer Butte is the highest elevation in Eugene, 2,058 feet. Alton Baker is the largest park in the area and is known for its Owen Memorial Rose Garden that contains over 400 varieties of roses and over 4500 plants. Alton Baker also features Pre’s Trail, a running trail favored by celebrity track athlete Steve Prefontaine. Hendricks Park may be the most beautiful, as it is known for its stunning rhododendron garden. Hendricks is also known for Pre’s Rock, the location where Steve Prefontaine died in an auto accident. Given the outdoor locations, the weather, and the University’s rich track history, Eugene has a large number of competitive and recreational running clubs. Willamette Pass, a ski resort, is only 1-hour west. For those wishing a longer drive to ski there is Hoodoo, which has 6 lifts and 34 trails, and Mount Bachelor, which has 11 lifts and 101 runs. Mount Bachelor is the 2ndlargest single mountain ski resort in the USA and 6thlargest overall. Bachelor offers a lengthy ski season from mid-November to the end of May. Timberline at Mount Hood is only 2.5 hours away and offers year round skiing and snowboarding. There are also multiple lakes, reservoirs, waterfalls, hot springs, forests, and mountain bike trails proximal to the city. For those wishing a slightly longer drive, the Mount Hood Recreation Area is 2.5 hours north and west. In addition, to the aforementioned skiing activities, the Mount Hood area provides many miles of outstanding hiking trails, kayaking, rafting, and camping opportunities. The Three Sisters Wilderness Area in the Cascade Mountain range is a 3-hour drive and includes 14 glaciers and over 260 miles of trails. The Oregon Dunes National Recreation Area is only a 1 hour-45 minute drive toward the coast and features the largest coastal sand dunes in the USA, as well as stunning Pacific Coast vistas. During our visit, we toured the neighborhoods to obtain knowledge of the city, visited local veterinarians to promote CPT, ran up Spencer Butte, visited Skinner Butte, Hendricks Park, and the University of Oregon Campus, and hiked several trails in the Mount Hood Wilderness. CPT looks forward to a long and prosperous relationship serving the dog owners of Eugene, Oregon.